In the top middle area of the web page is a (3MB) pdf file of an article in Sept 2003 issue of PC World, about third-party inks. 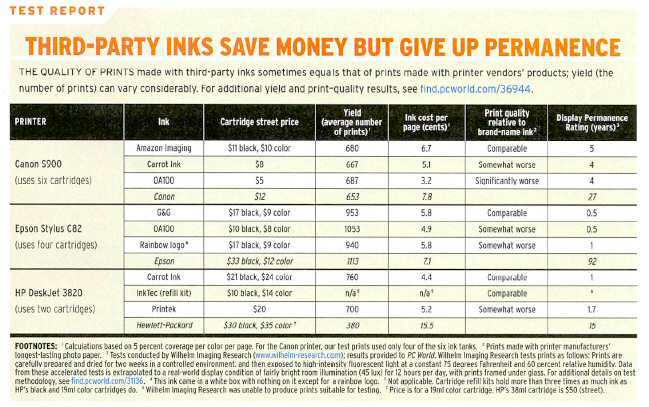 Third-party inks are much less expensive than the printer manufacturer's ink, but they're also much less durable. 1. For the Canon S900 printer, photos printed with the third-party ink will last 4-5 years while photos printed with Canon ink will last 27 years. 2. For the Epson Stylus C82 printer, photos printed with the third-party ink will last 0.5-1 year while photos printed with Epson ink will last 92 years. 3. For the HP DeskJet 3820 printer, photos printed with the third-party ink will last 1-1.7 years while photos printed with HP ink will last 15 years.